In an ideal world, every child would be born into a loving stable family, yet the reality is that many children are not. For the more than 400,000 children living in foster care, the goal is to establish safety and permanency with family members or to find adoptive families to provide “forever” homes. Unfortunately, LGBT families who wish to foster and adopt are often barred from doing so by archaic and discriminatory laws, policies or practices. This need not be the case. 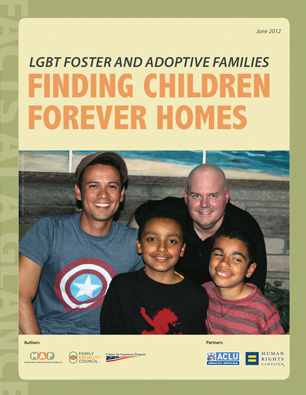 Finding Children Forever Homes: LGBT Foster & Adoptive Families highlights the compelling need to find adoptive families for waiting children, provides an overview of the barriers faced by LGBT families wishing to foster and adopt, and includes targeted recommendations designed to ensure that LGBT families can help fill the need for loving, stable foster and adoptive homes for children. The brief, which is based on content from All Children Matter: How Legal and Social Inequalities Hurt LGBT Families, was produced in partnership with the the American Civil Liberties Union (ACLU) and the Human Rights Campaign (HRC). Both reports were co-authored by the Movement Advancement Project (MAP), the Family Equality Council and the Center for American Progress. Movement Advancement Project, Family Equality Council, and the Center for American Progress. June 2012. Finding Children Forever Homes: LGBT Foster and Adoptive Families. http://www.lgbtmap.org/finding-children-forever-homes (date of access).